I'm a bit late in starting this reviewing craziness, but now that I'm here I'm ready to not only win- I want our team to win by a landslide. Here we go! I also like the picture you added for the background. It's rare to see this version of creativity on YWS. Also, the picture captures some of the mood you are trying to set in this piece, so well done with that. If it didn't capture any of the words' emotion then this picture would certainly be a lost cause, so good job not falling into that trap. I don't have a whole lot to say, given this is only a few lines long haha. However, I will be reviewing more of your works shortly. Can't wait! Given that the art section isn't used so often, it's a little hard to critique this. Plus my artistic ability never evolved beyond stick figures lol. That said, I'll do my best. First, the picture itself: One, you should give proper credit to the source beyond just saying it isn't yours. I think with today's meme/sharing culture stuff can spread around without us ever knowing where the picture came from, but it's best to give credit where credit is due. Secondly, it's a pretty picture, but the type doesn't contrast with it very well. Maybe it ought to be a bit bolder? Also, the last "them" is cut off on my laptop screen. I will say that the beach scene kind of fits with the quote, as it kind of sounds like trying to hold on to grains of sand, and you can't hold on to a moment in time, either. About the words themselves: they're pretty, but kind of vague. What is this "them" we're talking about? Are we talking about people? One specific person? Further adding confusion is the name "Faith". Is this supposed to be Faith (the abstract concept) speaking, or just a person named Faith? 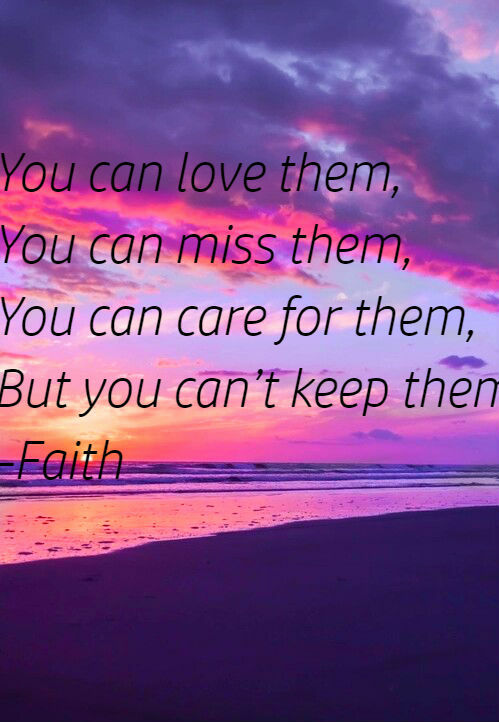 The idea of Faith talking about people is kind of interesting, but I feel like it would have to be explored more than in an Instagram-style quote. The idea of using a picture to add to the words has potential, but I feel like a short poem or quote has to be really tight to work as a good poem. I will say that thinking about the picture made me come up with some interesting applications of the words, but I would like the words to be a little more specific so I understand what the quote is supposed to mean. Hey, hi, hello! Cyr here to review this (rather short) piece of yours! Love the emotion here. I haven't really seen anything posted in this style, that being with a picture serving as a background, on Young Writers Society before. So points for originality. Its length, though handicaps the emotion a bit by making so much more superficial. I hesitate to say it, but it sort of like something I would find when scrolling through one of my relatives facebook feeds. That may, in part, be due to the background though. The choice to rhyme them with them over and over isn't exactly something I would like to get behind though. But hey, I have no proper training here, so whatever.